The bees don’t care about the frames or foundation inside the frames. If the frames or foundation happen to be parallel to the Earth’s gravitational pull, then the bees will build straight comb that fits conveniently on the frame just that way we humans like it. 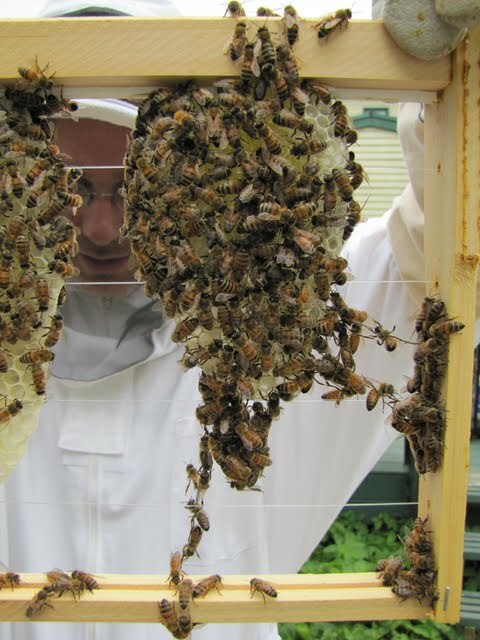 If not, the frames — and the foundation in the frames — only get in the bees’ way and you end up with cross-comb. That’s why the ideal positioning of a Langstroth hive is level from left to right — to prevent cross-comb — and slightly tilted up on the back so that any moisture that happens to collect inside the hive will pour out the front entrance and not pool inside the hive. ADDENDUM (April 05/14): I used to carry a carpenter’s bubble level with me whenever I set up a new hive (the hives can shift over winter as well, as I learned today), but these days I use a Bubble level app on my cell phone. (I happen to have an Android phone, but I’m sure similar apps are available for other types of smart phones or devices.) There are many free apps to choose from and, for me, I’d rather have an easy-to-use app already on my phone if it means I don’t have to carry around another piece of equipment when I’m tending to the bees. This entry was posted in Behaviour, Comb, Month of July, Year 2013 and tagged Stuff That's Good To Know. Bookmark the permalink. I updated this post today to include my big thoughts about using a bubble level app to help keep hives properly levelled.